“The eyes of the nation are on Georgia’s governor’s race, and there is widespread recognition that the touchscreen machines are not reliable,” stated Marilyn Marks, who heads CGG. The motion comes on the heels of a September 17 decision by the same court, the US District Court for the Northern District of Georgia, which denied a proposal that would have forced the state to move to paper ballots instead of the touchscreen voting machines. The decision, issued by Judge Amy Totenberg, agreed with the plaintiffs that Georgia’s voting system was not secure from hackers, but determined that it was too close to the election for the change. Election integrity experts say there are bits and pieces of the election that can be audited or reviewed, like checking the math on a multi-step problem. First up is paper ballots. Though people who vote on election day will have to use the touchscreen machines, voters have the option of using absentee ballots. According to an Atlanta Journal-Constitution analysis of records from the Georgia Secretary of State’s Office, 17,436 absentee ballots have been cast as of Tuesday, compared to 8,819 ballots at the same point in the 2014 election cycle. These paper ballots will be read by an optical scan machine and the results will then be counted by the same computerized tabulator that counts all the votes from the touchscreen election computers. Both the optical scanner and the tabulator are susceptible to hacking, Marks says. That is why her group is asking the court to demand that the state audit the paper ballots to ensure accuracy — before the election is certified and the winners are made official. Certification of an election, which includes counting provisional ballots, usually takes one week after Election Day. Though it is not possible to audit the actual voting machines for accuracy — which would be possible with paper ballots — each machine prints out tapes that tally all votes made on that day on that machine. These tapes do not show each vote. Rather, like a receipt from a grocery store, they show how many votes were cast for each candidate using that machine. The lawsuit seeks to make the state store each of those tapes, add up the tallies, and compare the totals to the number of votes reported electronically. The concern is twofold. First, worry about cybersecurity for electronic-only voting machines. Second, classic human error. In order for votes from each machine to be tallied by the state, election officials have to pull a memory card from each machine and upload that information to a centralized system. Sometimes, according to Marks, people simply forget about a memory card or two. CGG also worries about election integrity before voters even get to the voting booth. Jasmine Clark, Democratic candidate for District 108 of the Georgia House of Representatives, checked her polling location and voter registration status repeatedly before heading out to vote in the July 24 primary runoff elections, according to her witness statement in the previous lawsuit. When she got to her polling place in Norcross, Georgia, the poll official told her she was not in the right place. She checked her information on the secretary of state’s My Voter Page online and it showed she had come to the right place. There was no explanation for the discrepancy. Clark spent a half-hour on the phone trying to solve the problem before poll workers told her that her name had suddenly appeared on the list and she was allowed to vote. Others were not as lucky, according to Clark, who observed a number of voters being told they had to go to another polling place. If they persisted in voting despite the inconvenience, their ballots likely would have been considered provisional for having been submitted in the wrong location. CGG documents in its lawsuit that the problem may be systematic. Marks said it dates back to August, 2016, when over 6 million voter records were exposed on a public server. 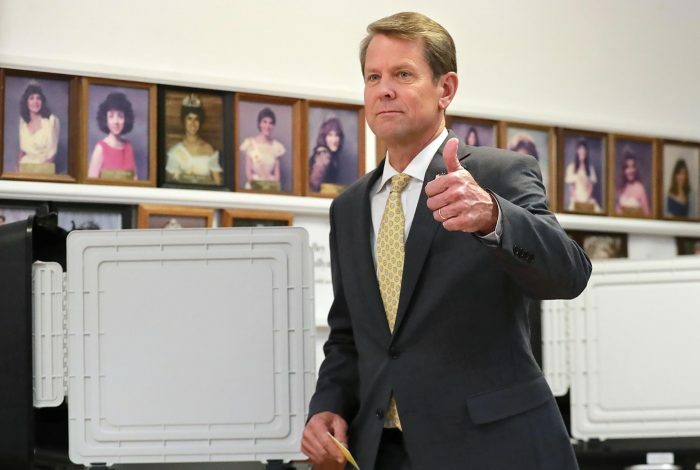 In its motion, the group also alleges direct misconduct by Secretary of State Brian Kemp, who is also the Republican candidate for governor, for “misinforming counties about state law, wrongly claiming that counties do not have the legal right to adopt paper ballots,” according to a statement it released. The deadline to register is October 9 and early voting starts on October 15. Marks believes that some Georgia counties still have time to install paper balloting before early voting. The CGG statement “urges voters to contact their county election boards and boards of county commissioners to ask them to make every effort to adopt paper ballots in the polling places for the November election, even if it is only feasible on Election Day,” November 6. At the very least, the lawsuit argues, the courts should require Georgia to use paper ballots for any December runoff or special elections. Current polls show Democratic candidate Stacey Abrams and Kemp in a neck-and-neck race, with Libertarian Ted Metz taking just enough of the vote to keep both leading candidates under 50 percent. That would require a runoff for the governor’s seat. A special election is already ordered for December 4 in Georgia House District 28, because the number of ballot errors during the Republican primary was larger than the tabulated margin of victory. Since no Democrat is running in that race, the special election will determine which GOP candidate takes the District 28 seat. Related front page panorama photo credit: Adapted by WhoWhatWhy from court and seal (US Courts).